The Family Tree/Családfa menu option at the top of the page now links to a new page with descendant and ancestor charts for the four branches of the family. The link to the interactive family tree is there as well. I like this family tree format from Legends software but it is limited to just 3 generations. Last month I taped together all the ancestor and descendant charts and it was about 12 feet long. Hope the links on this new page make it easier to see the big picture. Brigitte is our little sister that left us too soon. I love this photo of her but it makes me sad. 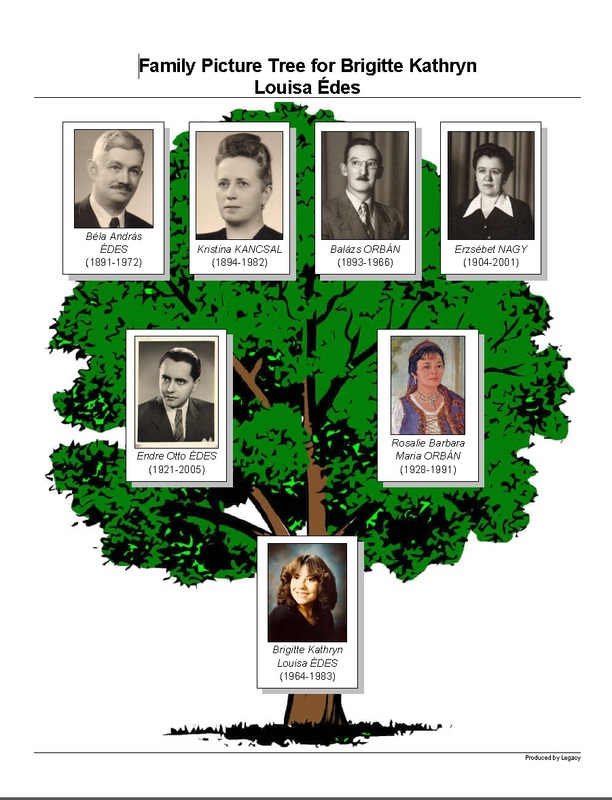 This entry was posted in Édes, Genealogy, Kancsal, Nagy, Orbán, Papers and tagged Family Tree, Hungarian Genealogy by edesorban. Bookmark the permalink. Tomorrow she would have been 49. She left us too soon. Today my first thoughts of her were her smile, hearing her laughter, remembering the joy shared with all. I have a picture of her holding Juliana as a baby. Glad I could connect with these fond memories. Missing her presence here with us.